Ultra-Romanticism (in Portuguese, Ultrarromantismo) was a Portuguese literary movement that took place during the second half of the 19th century and later arrived in Brazil. Aesthetically similar to (but not exactly the same as) the German- and British-originated Dark Romanticism, it was typified by a tendency to exaggerate, at times to a ridiculous degree, the norms and ideals of Romanticism, namely the value of subjectivity, individualism, amorous idealism, nature and the medieval world. The Ultra-Romantics generated literary works of highly contendable quality, some of them being considered as "romance of knife and earthenware bowl", given the succession of bloody crimes that they invariably described, which realists fiercely denounced. In Portugal, the first Ultra-Romantic piece ever written was the poem "O noivado do sepulcro" ("The tombstone engagement") by António Augusto Soares de Passos, while in Brazil the first major Ultra-Romantic works were the books Lira dos Vinte Anos (Twenty-year-old Lyre) and Noite na Taverna (A Night at the Tavern) by Álvares de Azevedo. In Brazil, it is called "the second phase of the Brazilian Romanticism", being preceded by the "Indianism" and succeeded by the "Condorism". 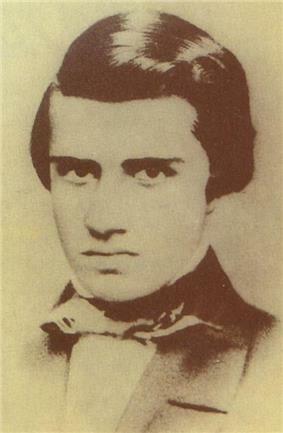 Álvares de Azevedo is one of the most well-known Ultra-Romantic Brazilian poets, winning the epithet of "the Brazilian Lord Byron"
The "Ultra-Romanticism" changed the ways of the Romanticism in Brazil. Values such as nationalism and valorization of the Indian as the Brazilian national hero, a constant theme of the previous Brazilian Romantic generation, are now almost, if not completely, absent. This new generation, heavily influenced by German Romanticism and works by Lord Byron and Alfred de Musset, among others, now focalizes in obscure and macabre themes, such as pessimism, the supernatural, Satanism, longing for death, past and childhood, and the mal du siècle. Love is heavily idealized, platonic and almost always unrequited, and the presence of a strong egocentrism and exacerbated sentimentalism in the poetry is clearly noticed.